We know that data analysis normally rhymes with complexity and headaches. But reporting your analytical efforts to your clients shouldn’t be painful or time-consuming. In fact, this is exactly what DashThis eliminates from marketer’s life: stressful reporting. Creating new a brand new dashboard from scratch for your client each and every month can be an unnecessarily long process. Not with DashThis though! With us, you can create your first analytical dashboard, and once it’s been created, it will automatically refresh its data every time you need it. You can even clone the template to use it over again with other clients. You probably already work with many platforms and tools that provide you with a lot of data to work with. Why not gather everything into one simple software so you don’t have to open a huge number of spreadsheets and integrations just to analyse all of their individual data? That’s what DashThis is all about: time-saving analytical dashboards. Building your analytical dashboard should be easy and enjoyable to do. It’s not because you display complicated data that the creation process needs to be painful. 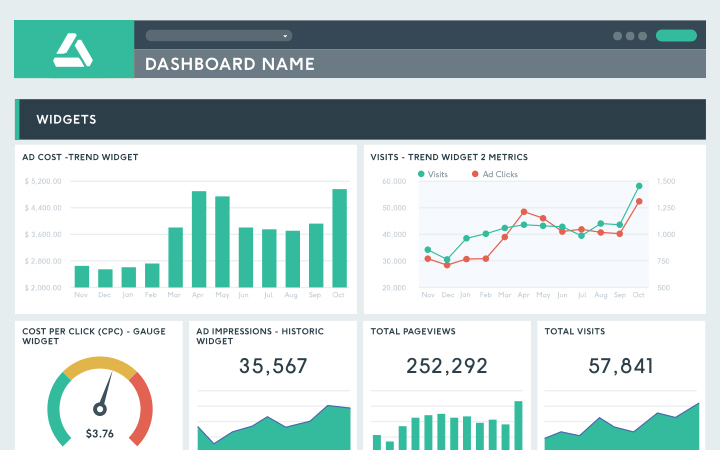 Even better, you don’t need any IT or design skills to create good-looking dashboards! DashThis is the kind of tool that makes you look like an exceptional designer to your client, without actually requiring you to put in that kind of effort. Google Analytics, Facebook, Google AdWords, Instagram, MailChimp… there’s so much data to collect from so many different platforms. This shouldn’t scare you though! By merging everything into one simple analytical dashboard, you’ll get a clearer picture of your data! An effective analytical dashboard is an incredibly valuable asset when it comes to showing your clients the results of your hard work. That’s probably why these agencies, among many others, have chosen to trust us with their reporting needs. Our number one objective is to make your dashboard creation as effortless as possible, and that’s why we provide you with the features you need. Intuitive and clear design, preset templates, all-in-one data collection, unlimited users, white labeling options… these are just a few of the features that make DashThis loved by so many agencies. Some analytical dashboard solutions will make you pay for each user working with your dashboards. Others will charge you if you want your own dedicated account manager. At DashThis, you only pay according to number of dashboards. Everything else is included. Replace the standard DashThis dashboard URL with one branded to your company (dashboards.yourcompany.com maybe?). Save on a custom URL and design with a white label bundle that includes both! An analytical dashboard just the way you want!